This post will outline why both of the above comments may be correct (or incorrect) by looking at asset class performance over various time frames / over recent credit cycles. Corporate bond spreads can be thought of as an indicator of the overall creditworthiness of the private sector, with widening spreads either reflecting a difficult environment for companies to service their debt or the perception by investors that it may be difficult for these companies to service their debt. In this post, credit risk is defined as the difference in the option adjusted spread “OAS” (the difference in yield between a corporate bond and similar duration Treasury bond) between junk bonds and investment-grade corporate bonds, which I’ll refer to as “quality spread”. The chart below outlines the month-end "quality spread" in percent terms going back to 1994, a time frame that goes as far back as I can get the high yield OAS data, as well as two bands reflecting one standard deviation above and below the three year month-end average spread. 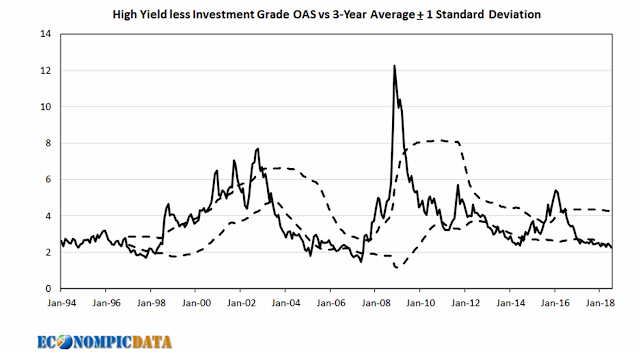 Are tight or wide spreads a better indicator for forward risk taking? Let’s take a look. Bucketing each starting month-end period into tight, normal, or wide buckets, the forward five-year average performance of investment grade corporate bonds, high yield corporate bonds, and the S&P 500 for the 1997-2018 time frame is shown below (1997 is the first data point for the bands three years forward from the 1994 starting date). In summary… over these longer-term windows, a low spread = a lower return (which would seem to indicate longer-term investors may currently be taking excess / uncompensated risk). In summary… over the shorter-term, low spread seems to = a higher return (which would seem to indicate investors may be more than fairly compensated to take risk given current fundamentals). Investment grade corporates provided positive performance in all of the various environments in this time frame, but volatility did pick up when spreads were both elevated and widening (as a frame of reference, IG Corporate bonds did outperform Treasuries in all of these environments except when spreads were elevated and widening - a period where they underperformed by 6%). S&P 500 returns were especially strong when spreads were narrow, as well as when spreads were “normal” and moving wider (perhaps noise over the previous month presented a buying opportunity). What I found interesting was the linear relationship between the level of spread and volatility (narrow spreads = much lower volatility). 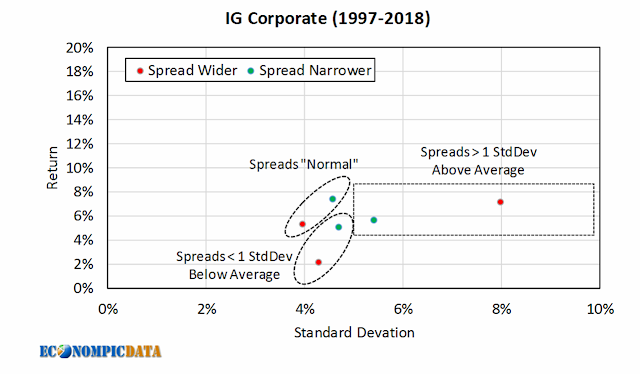 Finally, I found it interesting that the performance of US stocks was poor when spreads were elevated (irrespective of whether spreads were narrowing or widening, unlike the divergence in performance within high yield). The good news is the above analysis may provide some interesting signals for those with the flexibility to allocate tactically. 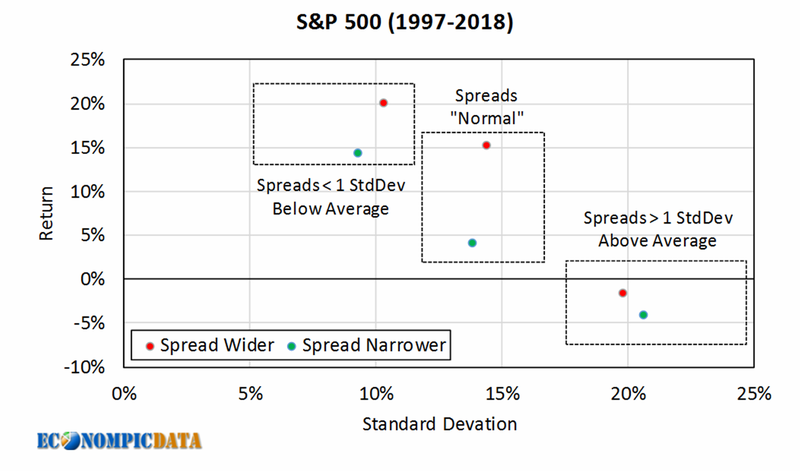 The bad news is that while I think the relationship between spread and the shorter-term performance outlined above makes logical sense, it may not work going forward. 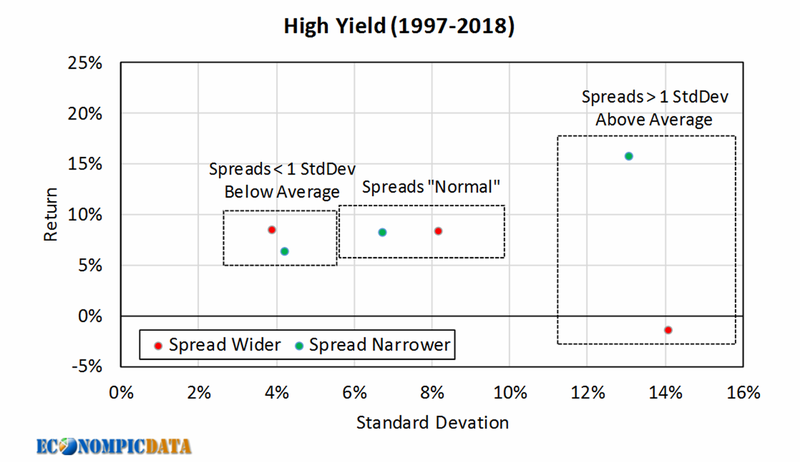 So the next time someone asks for a quick answer as to whether tight spreads have been a sign of exuberance among investors who were willing to overlook risk (which will end in tears) or an environment of high economic growth and low default rates, supporting risk assets... you can now respond.